Posted on Jan 12, 07:12 PM in Soups and Vegetarian. No comments. Today I was discussing, with a group, which foods are “filling” versus “non-filling” and the food that came up the most in the “filling” list was lentil soup. 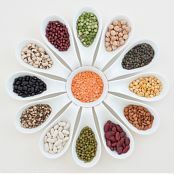 Lentils are a great source of protein and soluble fibre and also, generally, have a low GI so are bound to make you feel fuller for longer. They are also an excellent source of B vitamins. This soup is a great pick me up for lunchtime and should keep you going through your day. Posted on Sep 24, 09:53 PM in Main Course and Vegetarian. Comments . Someone asked for some good vegetarian slow cooker recipes today and I found this little beauty. A cassoulet, originating in the south of France, is a slow cooked bean stew. This recipe suits a slow cooker well. Slow cookers are an absolute necessity for the busy cook who wants to make sure his or her family eats well. Having a meal which can be quickly prepared in the morning, is cooking all day and is ready when you get in tired from work takes away the temptation to grab a quick take-away or bung “something and chips” in the oven. They are great for using up leftover vegetables too, as you can put just about anything in to make a stew or casserole.